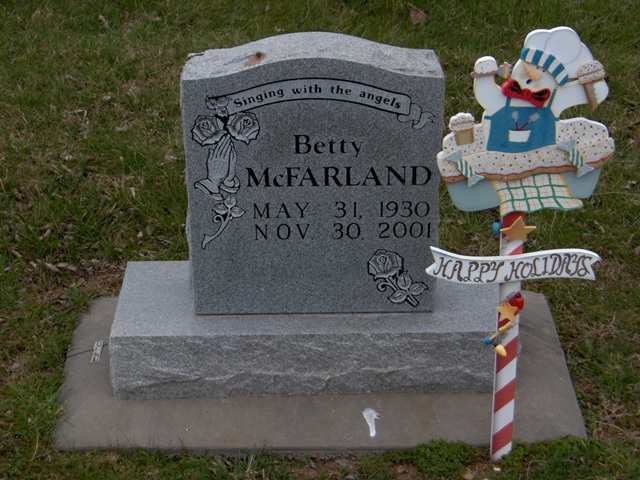 Betty B. McFarland, 71, of Sikeston died Friday, Nov. 30, 2001, at Missouri Delta Medical Center. She was born May 31, 1930, in Goobertown, Ark., daughter of August Martin and Luie Elmertie Shell McFarland. McFarland owned a childcare business and was a member of Ladd's Chapel Church. Survivors include a brother, Bill McFarland of Marble Hill, Mo. ; three sisters, Jane Stogsdill of Bloomfield, Mo., Pat Culp of Wickliffe, Ky., and Rosa Williams of St. Louis. She was preceded in death by her parents, a brother and three sisters. Friends may call at Liley Funeral Home in Marble Hill from 4-8 p.m. today. Funeral will be at 2 p.m. Sunday at the funeral home, with the Rev. Dale McFarland officiating. Burial will be in Bollinger County Memorial Park Cemetery near Marble Hill.